While we love our international client base, we’re even more dedicated to providing plastic molding services to local customers in Texas. When it comes to plastic injection molding in Texas, no other company can match the Superior Plastics mold quality or delivery times. Why should Texas businesses choose Superior Plastics for their plastic injection mold company? We have over 30 years of experience in the plastic molding industry in the Dallas, Fort Worth (DFW) area. Our meticulous attention to detail coupled with our Texas heritage simply gives DFW based businesses the best choice. We’ll work fast to give you an accurate estimate for your next project. We are ISO9000 certified and AS9100 compliant and prepared to serve your needs. 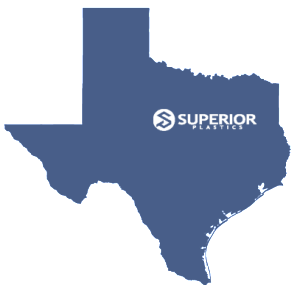 We’re confident that we can manufacture and ship parts to Texas companies faster than anyone else. Give us a call or get a quote, and find out how fast we can ship your mold to you! If you’re located in one of the areas below, we’re willing to bet that we can get your plastic mold shipped to you faster than any one else.